The historic Apollo’s 2000 banquet hall in Little Village was lined with monitors. The entire room seemed to be buzzing with anticipation of not only Bernie Sanders, but the Southwest Side’s own Jesús “Chuy” Garcia. 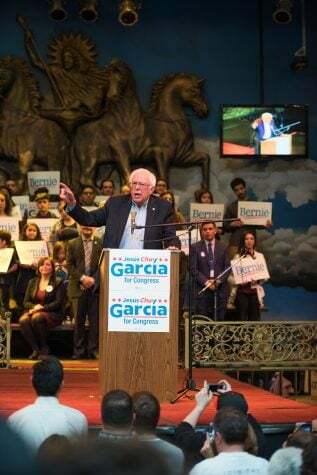 Garcia made another push forward in his congressional campaign with a rally on Thursday, Feb. 23, which included a visit from Sanders. A mariachi band was on stage, singing jaunty tunes in Spanish. Most of the audience was Latino and a lot of them joined in by singing along before the band made way for the progressive slate of candidates lined up to speak that day. Garcia currently sits on the Cook County Board of Commissioners, representing the 7th District. “We are here today because we wanted to let Bernie Sanders know that the revolution is alive and well in Chicago,” Garcia said at the rally. Garcia’s run for Congress is no surprise. U.S. Rep. Luis Gutierrez, whose seat Garcia is running for, endorsed Garcia after announcing his retirement in November. Garcia famously challenged current mayor Rahm Emanuel in 2015, forcing him into a runoff election. Gutierrez backed Emanuel then, even as Emanuel sat on a potentially damaging video of the shooting of 17-year-old Laquan McDonald, who was shot by a Chicago Police officer 16 times in 2014, until the runoff had already happened. In the opinion of Chicago Tribune columnist John Kass, if these two things hadn’t happened, Garcia could very easily have been mayor of Chicago today. With the 2019 mayoral election fast approaching, some speculated that Garcia may run again. 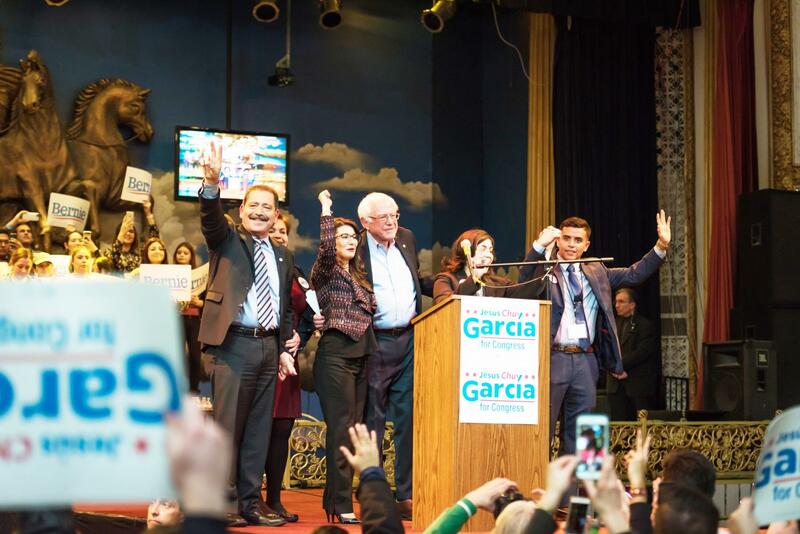 Instead, Garcia is pushing for a seat in federal government, though he has been making very clear that Chicago, and particularly his old stomping grounds in the Southwest Side, are his priority. 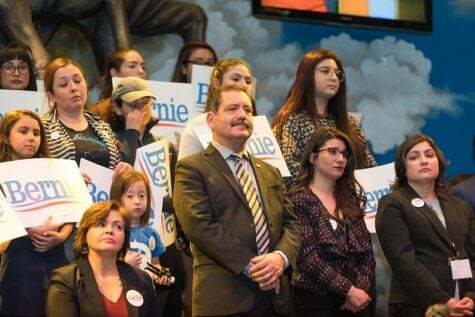 “This afternoon, we should be so proud of what we have embarked on to transform Chicagoland politics,” Garcia said at the rally. Garcia stressed that he was pushing to change the nature of politics in Chicago, especially by having people in office who work for the people they are representing, not the political machine. Bernie Sanders applauded Chicagoans for becoming civically engaged since the 2016 election. Vermont Senator Bernie Sanders was the last to speak, fully endorsing all candidates present at the rally. Much of what he said focused on politics on the national stage, but he stressed the importance of the congressional race here in Chicago. “We need people willing to stand up to the billionaire class,” Sanders said. Much like the rhetoric from his 2016 campaign trail, Sanders reiterated the idea of a political revolution and he stressed the importance of a grassroots campaign overtaking the status quo. Sanders, who gave a rousing speech in the same vein as many of his presidential stump speeches, made note of the same point. Much of what the other candidates said reflected this sentiment. They are looking for a political revolution—to “take back” the city of Chicago the wealthy and the corrupt.